A few weeks ago in X-Men Red Annual 1, Jean Grey met a bigoted anti-mutant protester and showed him kindness and compassion, relating to the turmoil and abuse he dealt with in his home life and continuing to worry about him long after their meeting had come to an end. Compassion continues to be Jean’s weapon of choice in Tom Taylor and Mahmud Asrar’s X-Men Red 5, and it’s a weapon she’s more than capable of deploying against an entire army. 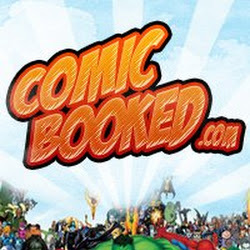 In the issue’s climax, Jean’s team stands between a group of mutant refugees and the Polish army, who are attempting to place them in detainment camps (Cassandra Nova’s idea). 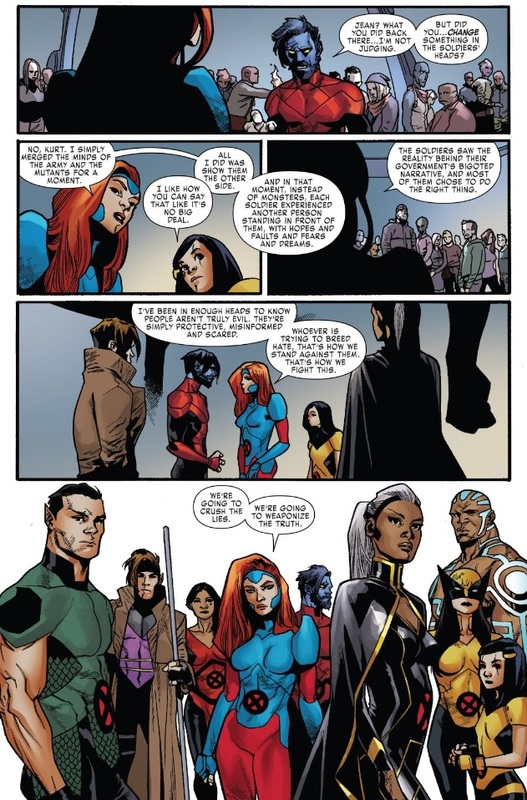 Jean’s priorities are more defensive from the start — Taylor and Asrar devote an entire splash page to the team charging into battle, but Jean accompanies this dynamic image with a battle cry of “Protect them, my X-Men.” Non-violence and defense are Jean’s game, and true to her word, her X-Men never attack a soldier outright, instead focusing on deflecting bullets and dismantling their weapons. Eventually Jean hits the soldiers with a psychic whammy that makes all but one of them immediately drop their weapons, but even this potential nuke is more benign in nature. Neither Jean nor Cassandra Nova are stooping to outright manipulation or control — Nova is confirming humanity’s worst impulses and biases, while Jean is attempting to expand their minds, to force them to put themselves in others’ shoes. It works, too, leading Jean to believe that her truth will always be more effective than Nova’s lies, that her compassionate approach will yield better results than Nova’s warmongering ways. 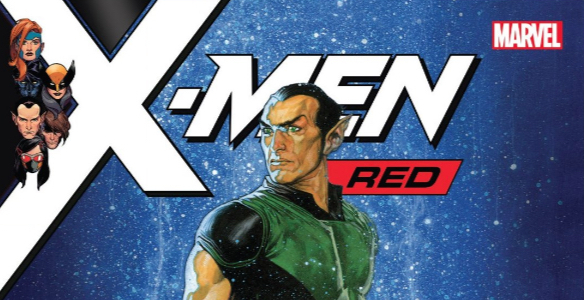 So far, X-Men Red seems to agree, and not just when it comes to the Polish army. Even on a small scale, Jean is able to win over David Bushell, the man who was pushed into killing a mutant protester in issue 4, by showing him compassion: she frees his mind from Nova’s influence, sneaks his father in to visit him, and promises to defend him when he needs it. Taylor doesn’t dig into David’s thoughts, but it seems clear just by the expression on his face that Jean’s won him over, simply by reaching out to him. It’s an incredibly idealistic mindset, one I hope is true even as a part of me doubts that it could ever be as effective in real life. Either way, though, it’s one I’m certainly going to try to implement more in my own life. If Jean Grey, someone who can read the mind of every person on Earth and see their every horrific thought and impulse, can find it in her heart to nonetheless believe in mankind’s inherent kindness and reach out to them with genuine compassion and concern, then I really have no excuse not to try. The ‘is compassion too optimistic’ idea will come down to Cassandra Nova’s response. To some degree, it si true. Being able to connect empathetically is the best solution. But the strategy’s flaw is that it only works if that connection can be made. The problem withTrump voters is that they have, essentially, a long list of defenses against that, through systems that reinforce the cruel messaging. The problem is that Fox News and Brietart create defenses, and then rebuild what damage happens. I hope Cassandra Nova’s response is equally effective. I love Jean using her powers like this in interesting ways. But there needs to be an opposite effect to not overly simplify the soution. But empathy isn’t Jean’s only tool, and I love the other one. One that is very effective and underused today. And one that fully embraces X-MenRed’s unique differences. Political Capital. Namor using the borders of th enation to his advantage is fantastic, as a key reminder of a very important strategy. Use what political power you have to protect others. What I love about this is that it is pragmatic. Built on providing meaningful help, even when idealistic options don’t work. Can Jean’s idealistic strategy work? Is it as simple as truth or deprogramming? Maybe. But if not, you can’t say Jean is sacrificing lives on idealism.